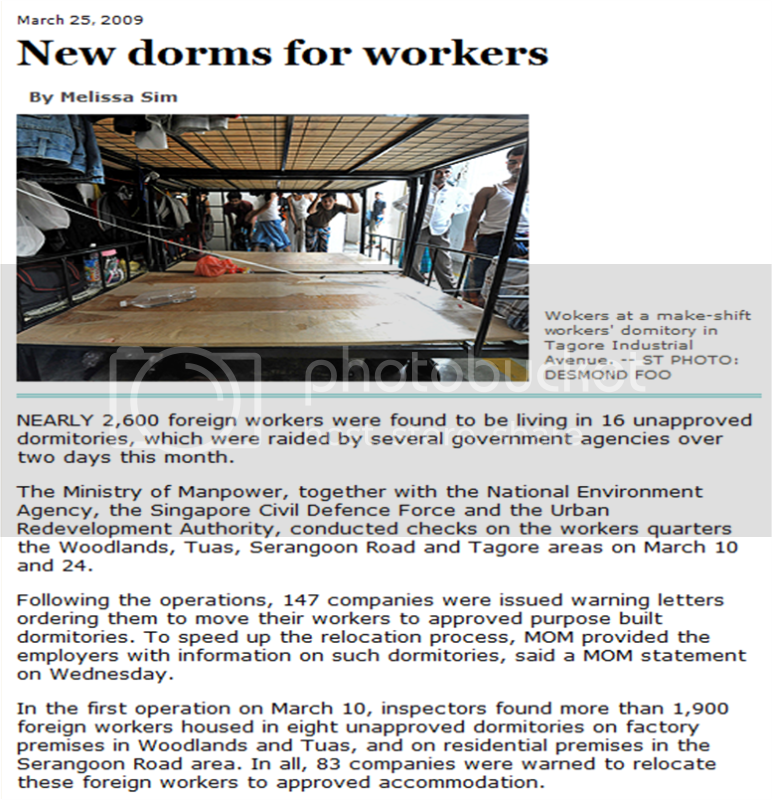 In a press release on 25 March, the Ministry of Manpower said it conducted two nationwide operations on 16 foreign workers’ dormitories on 10 March and 24 March 2009. In the operations, which were carried out together with the National Environment Agency (NEA), the Singapore Civil Defence Force (SCDF) and the Urban Redevelopment Authority (URA), a total of 147 companies were issued with warning letters to relocate nearly 2,600 foreign workers to acceptable accommodation over the next few weeks. The companies were warned to comply with regulatory requirements, and that employers abide by Work Permit conditions to provide their workers with acceptable accommodation. In the first operation on 10 March, more than 1,900 foreign workers were found to be housed in eight unapproved dormitories (factory premises in the Woodlands and Tuas, and residential premises in the Serangoon Road area), MOM said. “By 20 March, more than half of the workers have been relocated to new accommodation that is in compliance with all regulatory requirements,” the ministry said. Divisional Director of the Foreign Manpower Management Division of MOM, Mr Aw Kum Cheong, said “it is unacceptable that employers house their foreign workers in illegal or unapproved housing to save costs.” He warned that this “will not be tolerated”. “All the agencies involved in these two operations will continue to coordinate closely and more operations will be conducted in the future,” Mr Aw said. While it is heartening to note that MOM has finally taken the issue seriously enough to carry out the inspections, there are a few questions which remain. In its press release, MOM said that if the employers failed to comply with its instructions to move the workers to appropriate and approved housing within the next one week, the work permits of the workers will be cancelled. Cancelling the work permits of the workers means that the workers will be repatriated. Why is MOM penalizing the workers when it is the employers who are responsible for housing them in illegal accommodation? And since the accommodation is illegal, should not MOM require the employers to refund to the workers the rental which they were made to pay to their employers? In its press statement, the MOM said, “Acceptable accommodation is now readily available in purpose-built dormitories and there is no excuse for employers to house their workers in unapproved housing.” In previous TOC reports, most workers told us that they were made to pay S$100 for the accommodation, including those who were made to live in containers. And as many as 20 workers were housed in each container, generating a collection of $2,000 per month for the employers. Most of the workers that TOC met were also unemployed. Thus they would have the rental deducted from any settlements they may have with their employers before they were sent home. Lastly, one wonders if the latest action by MOM has anything to do with the upcoming visit by the Minister of Manpower to the newly-built “up-market” Avery Lodge dormitories. The Minister is expected to officiate at its opening next month. The dormitories will house up to 8,000 workers. Avery Lodge is a Morgan Stanley-controlled venture. Despite the remaining issues, MOM should be applauded for its latest actions against errant employers.